Counting in a foreign language is one of the first things we learn, yet it takes very long to master. This is not because counting in Chinese is exceptionally hard, but because it’s the case that counting is a task that looks easy but is actually quite difficult. I also think that most students abandon practising numbers too early, leading to a surprising and serious gap in our knowledge. I include myself in this category of students; this post is mainly the result of my finding out that I’m really bad at numbers in Chinese. In this article, I will discuss a few reasons why counting is difficult at different stages of learning Chinese. Let’s look at these problems in turn, but feel free to skip to the second and third question if you’re an intermediate or advanced student. Beginners and teachers should really look at the first question, though. Beginner courses typically teach you how to count to one hundred after just a few days. I think this is excellent, because the numbers from 1 to 99 contain most tone combinations and is therefore perfect for pronunciation practise. At the same time, everyone knows that being able to count is essential in everyday life. The problem is that counting is almost always done in sequence, at least for numbers above ten. 一二三四五六七八九十 and so on. This is a natural place to start, but many teachers (and therefore, their students) get stuck here. This means that students learn the sequence, not the numbers! Thus, I have met many beginners who can count to 100, but struggle to translate individual numbers (78, 23, 40 and so on). They know how to say 78, but only if they say 77 before that. And only 77 if they said 76 before that. Of course, given enough time, they can still produce the right answer, but the point is that simply counting to one hundred doesn’t teach us all those numbers properly in Chinese. We need to actively think of the meaning of the sounds we produce. These exercises remove context, which is good. Since I started learning Chinese, I have never ever been requested to count to one hundred, so this skill isn’t what we’re after. Naming any number between 1 and 100 is essential, however, but we don’t practise that if we’re just counting up starting from zero. This continuous up through the counting system, so ten thousand ten thousand gets a new name: 亿/億, which is equally to one hundred million. Curiously, the pronunciation of this character is yì, which might lead to some confusion However, this should always be obvious based on context (if you think a company is worth 51 dollars, you can be quite sure it’s 五十亿 and not 五十一). This is very easy to learn in theory, but hard to master in practice. Use a stopwatch to see how long it takes you to figure out how to say the following numbers in Chinese. I’ve grouped them as we would in English. Naturally, we’re not requested to say large numbers very often, but I needed almost five times longer to say these numbers in Chinese compared to my native Swedish. When someone asks you how many people live in your country or how far it is from your home city to the capital, you don’t want to spend 15 second trying to figure out how many zeroes there are in the number and how to divide that into a Chinese number. Learning numbers is not only for your first week in class. The third and last problem is related to listening ability. Because of the above-mentioned phenomenon of having zeroes in groups of fours (0000) instead of threes (000), understanding large numbers in natural speech is quite difficult. Of course, if you hear a random number, you might be able to write it down. However, what if it’s in a lecture or news broadcast and you have lots of other things to worry about? You can’t think for five seconds and then have your answer! I think the problem arises because we are almost never tested on numbers, neither inside nor outside the classroom. What do I mean by this? Basically, when you listen to news in Chinese and someone says a big number, you don’t need to know what it means, you just need to know that it’s big. You think you know how big the number was, but could you actually write it down while listening without missing something else? I’m sure you can do this very easily in your native language, but I find it hard in Chinese. Another example is telephone numbers. I did a small experiment with myself. A native speaker read 16 randomly generated numbers to me in Chinese and I tried to write them down. To check the writing speed limit, I did the same in English (which should be very close to my native Swedish). Here are my best times (i.e., in how short a time all the numbers were read and I still managed to get all of them right). Twice as long! When people read phone numbers at a natural speed, they don’t read that slowly. So what if you don’t understand big numbers or small numbers read quickly? Does it matter? Yes, it does, for a number of reasons, most of which are related to listening speed. Numbers are supposed to be very easy and people will assume that you know them. If you listen to Chinese produced for natives and don’t know numbers quickly enough, this creates a lag and probably gaps in your listening comprehension. If you take exams in Chinese, they might ask you about dates, prices and phone numbers, so simply knowing roughly what the answer is isn’t good enough. In short, counting counts, even for intermediate and advanced students! Japanese does the same thing actually, grouping at four zeros that is. I dunno, might be related to the writing system. Your observations about number/counting related issues is accurate. I have found many of the same issues myself, namely delayed response, delayed understanding and inability to translate fast enough. So long ago I remember Ken Carroll of ChinesePod talking about this, although not the topic of the podcast, somehow numbers/math had come up and he too noted how math is one of the hardest aspects of learning a foreign language. Somehow it is just different than basic vocab. In addition, on topic I remember another friend who does live translation and they too said, numbers are the worst, hardest of all to get right and get right fast. They said the best tactic they found is to write the number as they hear it which then gives them a visual to work off of as the translate it into the target language. This also brings up a post I just read on the Skritter blog, discussing “subject specific” learning materials, the post was about how they wanted to learn more sci-fi vocab so they had found a lecture series in Chinese all about the topic, which has does wonders in beefing up their sci-fi related vocab. Bottom line, for all the conversational Chinese we study, little if any class touches on math. I even thought about going to a basic math class being taught in Chinese by a native for kids as a nice way to start re-wiring the number system in the foreign language. Finally, you are in a bit different situation than me in that you have already learned a “second” language to a pretty high level… that being English, I’m wondering, based on your English/Swedish times above it looks like your English is only slightly slower than your Swedish time. Thus brings the question, why? Do you think it is because you started studying English at a younger age? Is that you have studying English longer? Or is it at all related to how you mentioned Chinese numbers are grouped different than the typical ten thousand, hundred thousand, million, billion, etc.? No doubt, numbers/math are yet another critical step in the learning of another language and not one that seems all to easy to beat! Regarding my Swedish/English times, it’s probably close because I studied maths and physics in high school entirely in English, which means that when faced with anything more complex than addition, I normally use English without thinking too much. I have also studied English for about twenty years and still use the language more than I use Chinese. It might be related to age, but I don’t think so. Interesting. Age is something that I am tracking in my language acquisition research. I had a friend that is deeply invested in the field who said that 12 years old is the “golden” age, meaning, as long as someone is 12 or younger when they start studying another language they will be able to truly master the language with no “foreign accent”. Sounds like you were younger when you started acquiring English so that could be a factor. Not to mention, you took subject specific courses in that language. i.e. Math class in English. to the last question of nommoc. I think that learning numbers and maths in any European language for a speaker of any other European language (with some exceptions) is easy simply because our languages have similar structure in this regard. Our maths tradition is similar. Even if you have sometimes to learn that in some languages (like Norwegian, probably Swedish, too; when I am in Sweden I communicate in Norwegian) you say e.g. “two-and-thirty” instead of “thirty two”, but the structure with high numbers is the same. That’s the main point. Of course there are languages with more irregular numbering systems, like French (think about saying “76” as “sixty-sixteen”, or “98” as “four-twenty-ten-eight”), then your problems with number in Chinese start becoming week. Or about numbering systems used in some African languages, where they count in twelves (“dozens”), not “tens”… I have started preparing myself to such a situation before going to Nigeria, e.g. by counting my steps in dozens in Polish (I have used the word “dozen” for “twelve” and I have invented a “Polish” word for “eleven”, it was “elv”, so that the original “eleven” and “twelve” which in Polish, unlike English, have a structure of “one-teen”, “two-teen”; could be used in their ‘original” position after “dozen”, because “-teen” started meaning a number between new “10” (i.e. dozen) and new “20” (i.e. two-doz, = old 24). So I was using words like “nineteen” (= old 21), “tenteen” (= old 22), “eleventeen” (=old 23); “tenty-eleven”, “eleventy-two”, “eleventy-eleven”… etc. But this was still counting in a series, with the consequences I have understood only now, while you have mentioned them. Because then I only realized that it doesn’t help at all, and even answering an innocent question like “how old are you?” becomes a challenge. You need to have all such answers prepared and learned by heart in advance. I have however learned quite quickly to calculate (and give, or understand numbers) in hindi, where after one thousand the digits (“number of zeros”) become separated into twos (not threes, like in English, nor fours, like in Chinese). You don’t have a special number for 1 wan, but you have “one lakh” which is 100.000 (10 wan), then you have “ten lakh” (one million), “1 crore” (ten million), “10 crore” (100 mln), 1 arab (1 billion). the numbers higher than 100 billion (1 kharab) are simply useless in 99.9% of daily situations. What helped me? I have started saying aloud (“half-aloud”) in hindi any number seen/heard randomly in the street, bus, etc. – tv advertisement, newspaper etc. – mostly they were telephone numbers, but that was okay, because I didn’t say them as the English practice is – each digit separately, but in the French way (or rather the Polish way). French say their telephone numbers joining digits into pairs, in Polish we join the first three or the last three digits, depending on which is more convenient to the person speaking, into a three digit series, using hundreds – and the rest is as in French – in pairs [at that time Polish phone numbers had seven digits]. So e.g. the telephone number 5267910 French would say as “five – twenty-six – seventy-nine – ten”; the same phone number you can say in Polish either as “five-hundred-twenty-six – seventy-nine – ten” or as “fifty-two – sixty-seven – nine-hundred-ten” (both are correct; NB. I have omitted the English “and” between hundreds and the rest). This way you practice the random numbers from 00 to 99, or even from 000 to 999. Alternatively (at another encounter with a random number0 you treat the number not as a telephone number but as a real life number, you have to say it in full, with lakhs and crores – or with wans and yis. (if I divided the Polish telephone number into the sequence of 2, 2, 3, it was exactly the Indian way of saying seven digit (10-million-range) numbers). Another practice was to add or to subtract the numbers – digits to/from digits, the first pair to/from the second pair; the 3-digit section second ; or to practice the multiplication and division table between the adjacent numbers or pairs and adjacent units? The numbers to be multiplied/divided/added/subtracted are given to you randomly, the results you have to find quickly in your mind (just like in a shop or in a marketplace). All in Chinese, of course. With 万/萬 think about it as the Greeks – one myriad, just learn to use this word in English instead of using “ten thousand”. 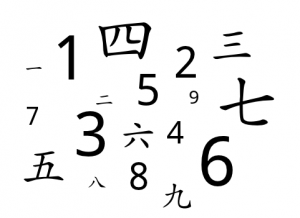 The first thing is you have to change YOUR way of thinking about numbers – in English as well; substitute the stereotypical, automated English words with a good sounding equivalent which will be a Chinese analog. Why instead of talking about a “millionaire” not talk about a “qianwanaire”? Nice! It seems so obvious after reading your article, but creating a fact-based mnemonic for each large number is something I never did. Here’s to more fluent conversations about business and the economy. Aside from how people separate a large number digits differently between English and Chinese, from an English-learning perspective there are 2 distinctively different way to say a large number even in English itself. I approached this by making an Anki deck specifically targeting fluency with Mandarin numbers. It had four fields: Mandarin numerals (e.g. 两万三千七百四十二), pinyin, Arabic numerals and the number in English written out in words (that last field is very important). Then it tested different things, e.g. giving you Arabic numerals and asking you to say them out loud in Chinese, or showing you Mandarin numerals and asking you to say them out loud in English (and then you could check very easily with the English words). Just press the button “Regenerate” (you may also adjust other options). As a Chinese , I think English is very difficult . I need to remember a lot of words . But Chinese , 3000 words are enough for you to speak and write suitable and beautiful sentences . I as recent learner I got the same impression it’s seems that in Chinese it’s ok to use and reuse the same words and combinations. In Japanese everything under 8000-12000 words (with a good balance of active and passive vocab) sounds like baby talk. I didn’t include this because it ought to be in most beginner textbooks, but your first version of 11 000 is right, except most people might perhaps just say 一万一 because there’s no risk for ambiguity (remember that 10 100 would need to have a 零 in there too). Your 688284 is right. Good morning.i am a beginner.i wonderfull thing for to discovery how to country in chinese language. This is an awesome blog post. Had lots of fun trying out the timed practice examples and comparing with other people. (I also confirmed that my mother tongue is French where numbers are concerned.) OK, I’m a bit of a nerd, but still, it’s a great example of making learning fun. How to say numbers is a tedious subject and difficult for people at almost any level of speech, even native Chinese I have discovered. But introducing the timing element makes it interesting and fun. And your reference examples are a great idea which I hope to use.